Ensure quick delivery of your Black Hawk College ID card! Make sure that Enrollment Services has your current mailing address. Your Black Hawk College ID will be mailed to that address. After having your photo taken, your ID will be mailed in seven to 10 business days to the current mailing address listed with Enrollment Services. What can I use my Black Hawk College ID for? I received my card in the mail – what do I do next? Activate the card at www.refundselection.com. BankMobile can issue a paper check and have it mailed to the current mailing address listed with Enrollment Services. It is very important that students keep their address up-to-date with Enrollment Services to ensure no delay in refund delivery. With this option, the check will be mailed out within seven business days. BankMobile can deposit the refund to a personal bank account. With this option, funds will be available in approximately one to two business days after processing. BankMobile VIBE account refund method which allows students to use their Black Hawk College ID as a debit MasterCard® and receive funds within one business day of refund processing. 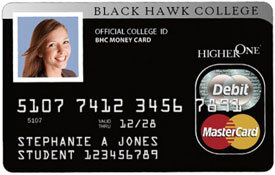 Please keep the card during your time at Black Hawk College for future financial aid and refund use. View our contract with BankMobile, a Division of Customer Bank here.